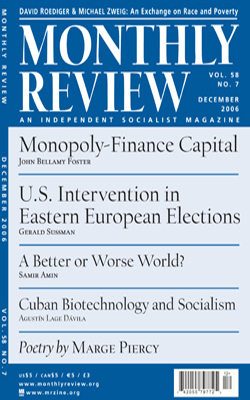 In his generally valuable "Six Points on Class" in the July-August 2006 issue of Monthly Review, Michael Zweig produces a statistic that goes to the heart of the issues of race and class that the issue so well raised. Professor Zweig writes that "in the United States two-thirds of all poor people are white." If this were true, since the white U.S. population is now below 70 percent of total population, this would mean that white poverty rates roughly mirror those of people of color. In fact, however, the census bureau figures for 2004 give a quite different picture (see http://www.infoplease.com/ipa/A0904269.html for the most accessible summary).